After her son died, West Linn resident Christine Steel found herself spending Thanksgiving holidays alone. It wasn't that she had nowhere to go; the truth was that it was simply too difficult to revisit her past without being reminded of what was missing. "Nothing felt right, including going to (Thanksgiving with) friends I'd known before his passing," Steel said. 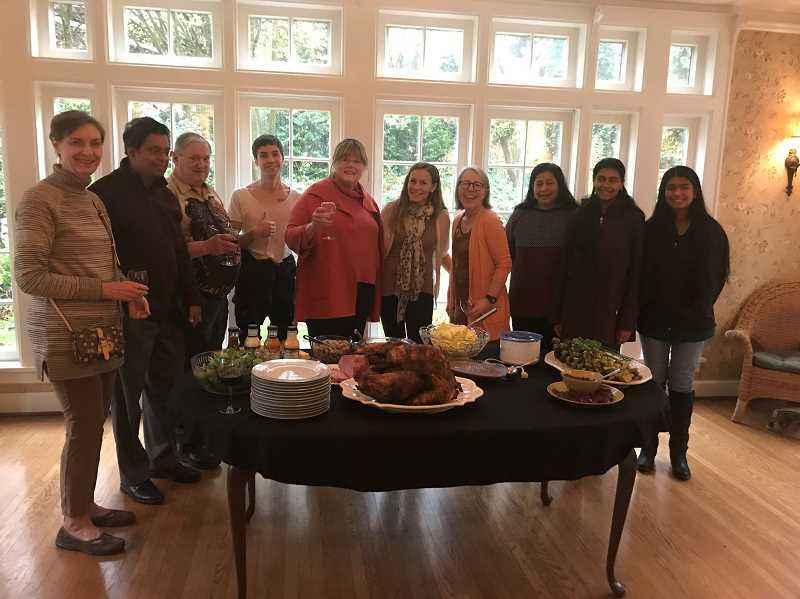 Everything changed four years ago, however, when Steel attended the first community Thanksgiving dinner hosted by fellow West Linn resident Emily Smith at Robinwood Station. Smith had nowhere to go for the holiday that year, so she decided to host an impromptu dinner with some of the people she'd met while volunteering in the city. The guest list fast outgrew the four-person table at Smith's home, and in the end about 15 people attended that first dinner. 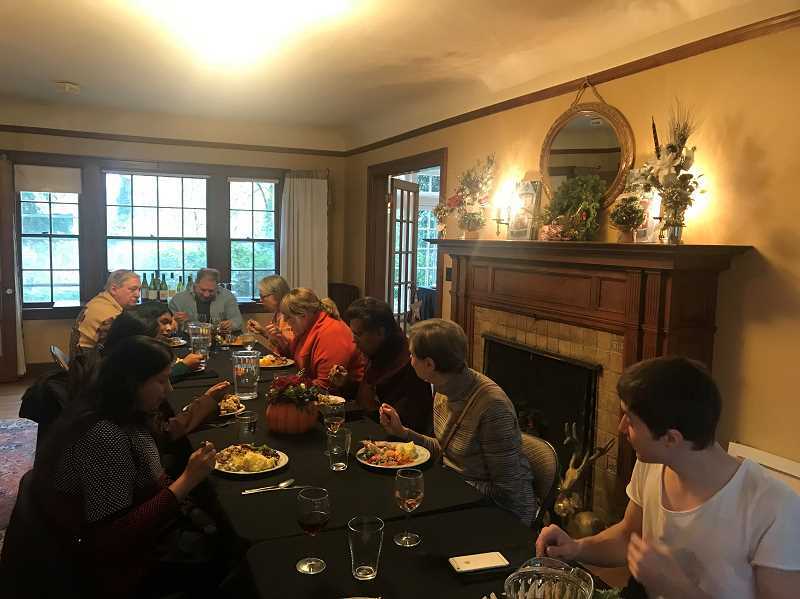 The event has since grown and moved to the McLean House, but the intent is the same: to provide a welcoming and communal atmosphere — along with some delicious food — for those who don't have somewhere to be on Thanksgiving. "A lot of our community events have a bit of an agenda, or there are hard feelings between one group or another," Smith said. "What I like about this event is there's no agenda. It's just about people coming together, celebrating being neighbors and community members, and having good food." Smith described the annual dinner as a "community event at its core," in that everyone brings something to the table. She also brings a tree each year and asks people to attach a note to it describing what they're thankful for. "It's a coordinated potluck," she said. "Everyone brings a different dish, and I just coordinate to make sure we don't end up with 12 dishes of yams." 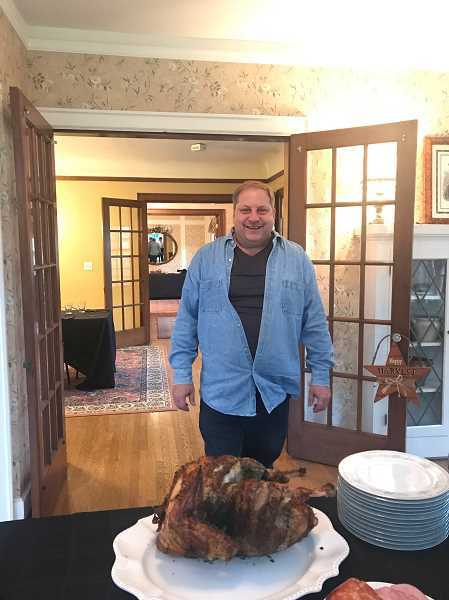 Steve Studer of the West Linn Lions Club handles the turkey — to much acclaim — and others offer their own specialty dishes. "We've had some dishes you wouldn't typically see at a Thanksgiving table that were creative, and a really great mix," Smith said. "Last year, we had a pita bread from a family (from) India — Kazi Ahmed (and his family) brought pita bread. I thought that was a not traditional but really fantastic addition." "Everyone cooks differently, and there's a lot of neat dishes I never would have tried," Studer said. "It always changes." Ahmed heard about the event through his volunteer work at Robinwood Station, and his family has attended several of the dinners. "Not having any family locally, it's kind of nice to have a get-together like that for the community, for those who have no other place to go," Ahmed said. "We have made some good friends. Thanksgiving is a good time to share our experience for the year. Each of us take turns talking about our favorite places we have visited or vacationed, favorite meals, those types of things. "We never talk about politics or sports ... maybe sports, but definitely not about politics." Resident Kris Duncan, who volunteers at the McLean House, is known for her ever-popular yam soufflé dish. She and her husband decided to stop by the first dinner, and they enjoyed it so much they've made it an annual tradition. "Even though I moved my parents nearby (since that first year), I manage to do (the community dinner) plus cook dinner for my parents because I don't want to miss it anymore," Duncan said. "I think it's just fun and kind of unique that somebody is reaching out and making sure that people who are close by in the neighborhood have a place to go." "It's more in tune with what the original Thanksgivings were, where it's the community and not just the family," Studer added. For Steel, what makes the event special is its welcoming atmosphere amid familiar faces. "I've been to other potlucks, like church potlucks and that type of thing," Steel said. "And because I wasn't a member of the church, I felt a little bit like a stranger. But with Emily's potluck, it feels like people have a connection to each other through the community. ... I've made some new connections, new friendships, and deepened friendships and connections with people I've known previously." Most of all, the event brought new light into a time of year Steel used to dread. "This was kind of a godsend for me," she said. "It's been very therapeutic. I know there are people out there who don't look forward to the holidays, because there's somebody missing in their lives. So events like this where you feel comfortable are very helpful in coping."